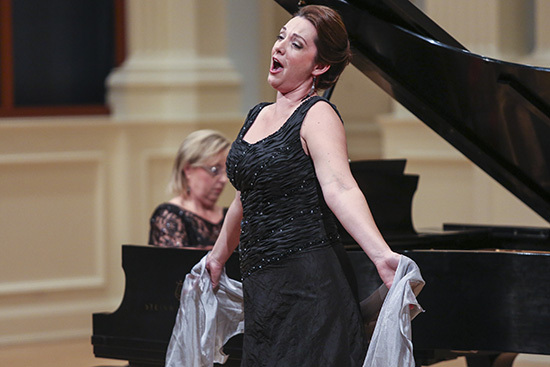 Samford University’s Christina Villaverde will be joined by several colleagues for “A Contemporary Musical Evening” Feb. 10 at 7:30 p.m. in Brock Recital Hall. The recital, which is being sponsored by Samford arts patrons Michael J. and Mary Anne Freeman, will feature new works by School of the Arts faculty and students, as well as various musical theatre, jazz and opera pieces. Villaverde, assistant professor of music, will debut two new songs written by music composition major, Adam Cobb, and a new piece written by School of the Arts professor Joel Scott Davis. This will be Villaverde’s first all English language recital. Villaverde will be assisted by other faculty members including Kathryn Fouse, Ron Shinn, Diana Preoteasa, John Robertson, Kristin Kenning, Demondrae Thurman and Samuel Nordlund.